Betadine Solutions have been used in homes and hospitals worldwide for more than four decades. 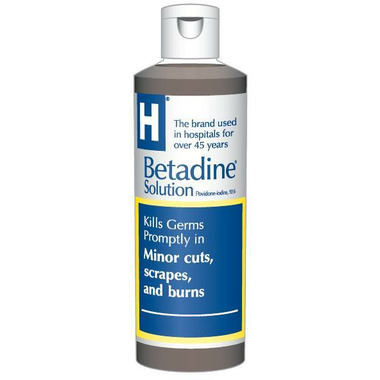 Betadine Antiseptic Solution Uses: first aid to help prevent infection in minor cuts, scrapes and burns. Betadine Antiseptic Solution Inactive Ingredients: pareth 25-9, purified water, sodium hydroxide. Do not use: in the eyes or over large areas of the body. Stop use and ask a doctor if: the condition persists or gets worse or you need to use this product for more than 1 week. Great addition to my medicine cabinet. Very good price for such a large bottle. Great product, always good to have this in your medicine cabinet. Really nice to find this at such great size. This product is excellent but difficult to find in the large size. Well.ca makes ordering and shipping easy and quick. This is a great product at a very reasonable price. I use this for my dog's allergies. It is hard to find in stores, but this site always has it in stock and delivery is quick and hassle free! An excellent product at a reasonable price. Great disinfection for both human and veterinary use. bravo!! !Betadine,you are my #1 product on my list . and with your product ,my list is very short. Used for both human and pet use. We always keep some on hand. Most effective antiseptic we've come across. This is a great product for wound cleaning. I keep it on hand for both human and veterinary use. 5 out of 5.very good product. one i trust. Ah finally I find Betadine in Canada! This disinfectant is amazing. It is used in Europe in hospitals and at home. It cures everything. I use this everywhere, literally. Betatine is really really great!